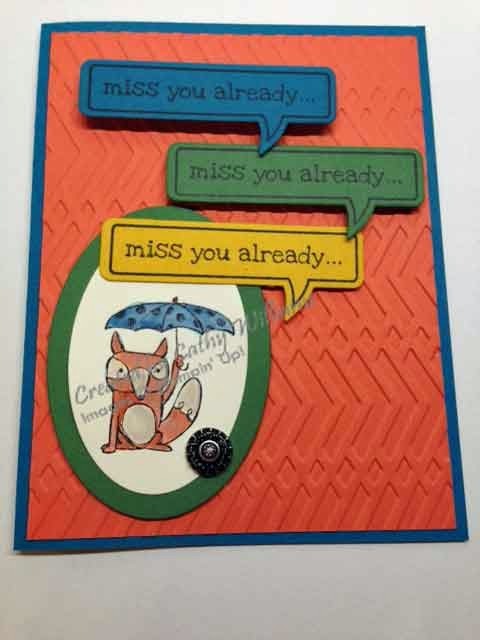 We made this card at a workshop some time ago and I ended up sending it to my daughter up in Montana because I really miss her! I had been up to visit not long before sending the card and thought this would be perfect. Plus, he's just a cute little fox! Sorry I haven't been posting in awhile - life just seems to get in the way. It is 2015 and hopefully I can be more consistent in my posts. I am going to cut down to three times a week (Monday, Wednesday and Friday) and see if I can keep to that schedule. Also, if you have been reading my Christmastime posts, you will wonder what happened to the video that I was working on. Well, my setup for recording turned out not to be the best - everything was upside down and when I tried to fix it, everything was backwards! You couldn't read anything. A friend recently began doing videos and I saw a picture of her setup. I hope to begin construction on a similar setup for my area and hopefully I can start getting videos out to you as well! Enough excuses! Here's today's card which we made several months ago at a workshop. 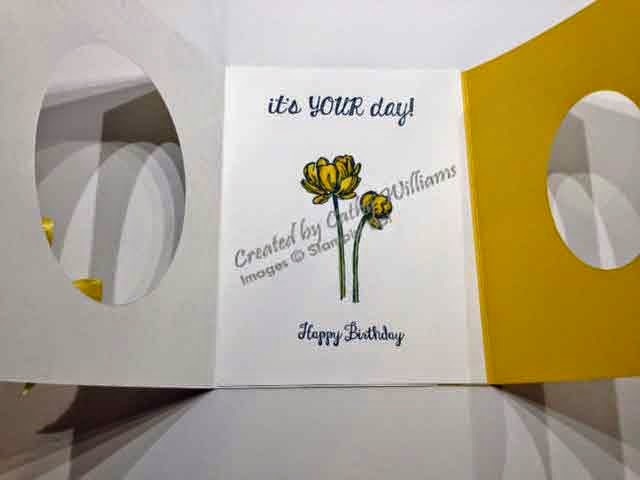 I am sure there is a better name for this fold but I call it a Layered Fold card. 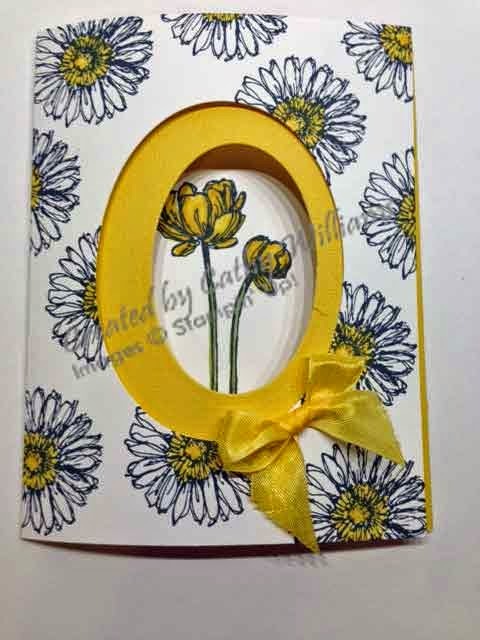 Here's my "hint" on making one of these cards: Cut your smaller oval on the outside white and inside yellow at the same time. Remove the yellow piece. Keep the framelit on your white paper and place the larger oval around it so you can get it perfectly centered. Then you can remove the smaller framelit and run it through your Big Shot. In the picture, the ovals do not look like they are even - that is just because of the white paper not laying perfect flat while I was taking the picture. Here's the inside of the card. How to make this card is on my list of videos to begin filming as soon as I get my equipment issue figured out. Check out this weekly's deals. 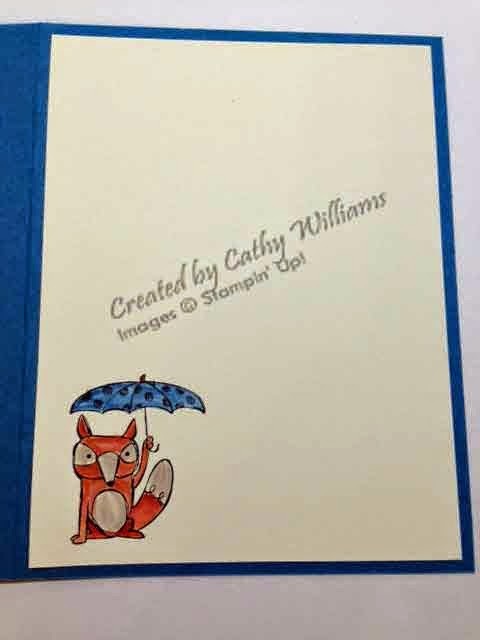 It is an embossing extravaganza!